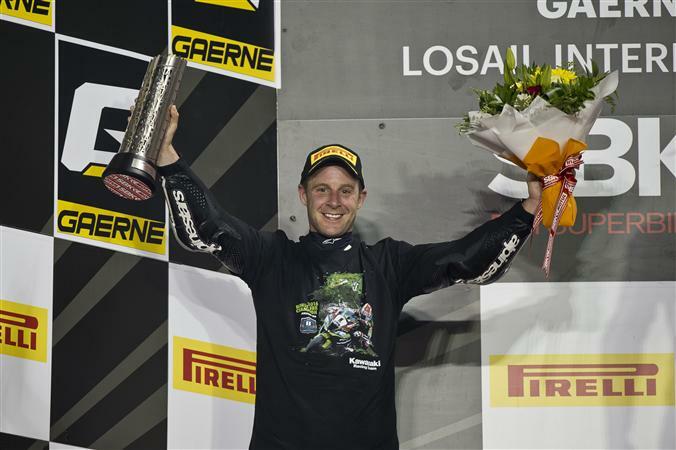 Kawasaki’s Jonathan Rea took his second consecutive WSB title at Qatar. Chaz Davies (Ducati) took his third straight double win at Qatar this weekend. Despite this, and eleven wins on the season, Davies had to settle for third place in the championship behind Kawasaki teammates Jonathan Rea and Tom Sykes. Why has he started talking like Steve McClaren? moto 3 is exciting …im a new fan ! When I first started watching WSBK I found it kinda boring. I assumed that was because the same three riders won pretty much every race. But I had to admit to myself that, at least prior to this year, the same was true of MotoGP–which I loved despite the fact that it was usually Marquez/Rossi/Lorenzo on the podium. Thing is, I’ve now watched all 20+ races this season, and yet things haven’t really changed for me. So I’m kinda wondering why that’s the case. Is it purely the fact that I (we?) know all the MotoGP riders and their personalities and conflicts–the “soap opera” stuff that just doesn’t seem to be as prevalent in WSBK? Is the racing lower quality in SBK? Objectively, it doesn’t seem like it. I’m sure most of the riders would do fine in MGP, and if you look at the lap times they’re really not very far off the prototype bikes–which is pretty impressive, actually. The MotoGP bikes themselves seem more dynamic and exciting to watch for some reason…but maybe I’m just imagining that. Is it simply the fact that it’s not the “premiere” racing series in the world? Or maybe it’s just that horrendous Kawasaki racing livery coupled with the fugly “face” of the ZX-10R (I kid because I love; multiple Kawasaki owner here). Anyway, curious if anyone else feels the same, or can offer insight. Nickey Hayden was on his way to a likely 7th in a MotoGP race a couple weeks ago. Not so different from where he finishes in WSB. Great riders in both sereies. Skill drops off much more quickly among lower placing WSB riders, but the riders near the front are outstanding. Plenty of fans think the WSB “show” is more fun to watch, but with 9 different winners in MotoGP this year (so far), it has been much more interesting to watch than in some prior years. Brian, I feel exactly the same way. This was my first season to really follow WSBK race-to-race. I was pondering the reasons why I didn’t really enjoy WSBK that much while trying to decide whether or not I was going to renew the WSBK video pass, but like you I really couldn’t come up with any solid reasons. All I know is that I just didn’t enjoy the races that much. I wonder if maybe it is because these past two MotoGP seasons have been pretty dynamic and exciting, making the WSBK races and championship seem like a bore in comparison. Perhaps WSBK, like MotoGP, has it cycles where some seasons are spectacular and others snooze-fests. I think you are correct concerning the personalities of MotoGP. I’ve watched a lot of those guys come up through Moto3 and Moto2, and I’ll be very familiar with some of MotoGP’s new faces next year for the same reason. With that in mind, I watched a lot of older races, interviews, post-race press conferences, etc. and now know quite a bit about the WSBK Factory Kawasaki, Honda, Yamaha, Ducati and MV Augusta (gotta love the underdog!) riders. Still, that hasn’t seemed to augment my interest any. I’ll give it another shot this coming season and see if I warm up to it more before I write it off. This year has seen a role reversal between WSBK and MotoGP. A couple of years ago, there were only 3 riders with any chance of winning in MotoGP and WSBK was a bonanza. Now we’re seeing the opposite. I can only speculate but I think it’s the combined effect of MotoGP’s changing regulations leveling the playing field and divestment in WSBK by factories and sponsors, leaving only a few teams with the resources to win. Lets recall that MotoGP had a lot of Rain winners this year. We all know that on a dry day if you are not on a factory Honda or Yamaha, then you aren’t up front. In WSBK, I do believe that the Kawasaki’s have been very strong the past few years. For some reason Aprilia has fallen off. Overall, I feel that WSBK has been a better show the past 10 years vs MotoGP. Next year will have new Honda and Suzuki in WSBK, and hopefully Yamaha will find the next Spies. Seeing the MV and BMWs often in the 5-10 place shows how much better balanced the WSBK product is. Don’t let the 2 Kaw and 1 Duck skew your perspective. Next season could be completely flipped in WSBK, yet we know nothing will change in MotoGP. WSBK is a lot about the bike brands, and MotoGP is a lot about the rider fan base. I watch both, but I play the WSBK in the VDR first. I don’t think that’s been the case this year. Cal just won in the dry, as did Ianonne on the Ducati and Vinales on the Suzuki. The new Hondas and Suzukis are why I decided to go ahead and renew the video pass next year. Yamaha has also been in it a year now and will hopefully have a more competitive machine. Cal is confusing to me. He seemed like an up-and-comer when he came to MotoGP, but has floundered. His Ducati whining sessions turned me off. Only the last few races has he really shown that he could run up front. Has Honda given his bike some upgrades to see if he would be a Pedrosa replacement if he had a top bike??? I think Cal has a lot of talent, and he did well on the Satellite Yamahas initially. Still, the guy crashes. A lot. He seems to be one of those on or off riders. Similar to Ianonne, he appears to have the skill to run at the front, but at the price of a probability of crashing that seems much higher than Rossi, Lorenzo and Marquez. Perhaps a Factory Repsol is all he needs to reduce his crash stats? I don’t know.